We love our weekend gunkholing! Pre-kid, it was easy to swing by the market Friday night for some essentials and then shove off early Saturday morning, returning late Sunday with time to ready for the week. Somehow, all the weekend chores absolved themselves. Clean piecemeal throughout the week. I used to set aside an entire morning to clean the whole house; now we clean daily in small parts. For example, I clean the bathroom while bathing the girls. Utilize grocery delivery services. We shop online and have it delivered, typically Sunday night when we return and are home anyway doing laundry and unpacking. There are many options including Hungry Harvest, Hometown Harvest, Peapod, Amazon, and Instacart. Walmart and Harris Teeter offer a pick-up option. Streamline packing. Leave essentials on the boat and have a “Go” bag for things that must be brought home and washed. Bathing suits, extra toiletries, and toys can be left on the boat for the entire season. Designate specific outfits, including PJs, that are immediately repacked after they are laundered. This way you are not making decisions about what to pack and wasting time hanging and folding clothes when they will eventually be placed in a bag anyway. Batch cook when you have time. We always have a few home-cooked meals in our freezer for hectic weeks. Engage the crew! Our three-year-old has her own swiffer, and she also helps with laundry and unloading the dishwasher. Right now, I use the term “help” loosely, but in a few years, she will not only be a pro but understand that this is an expected part of being in our family. More importantly, it gives her a sense of autonomy and mastery. 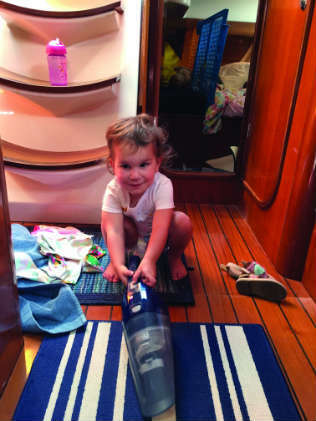 Skills that will be useful in her sailing career!